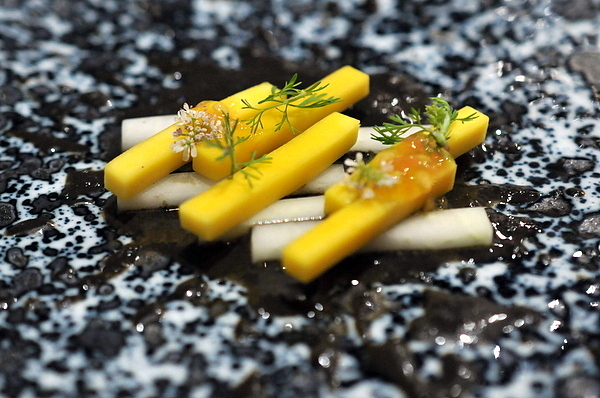 Dialogue, the tasting menu-only restaurant from Chef David Beran is easily one of this year's most exciting restaurant openings. 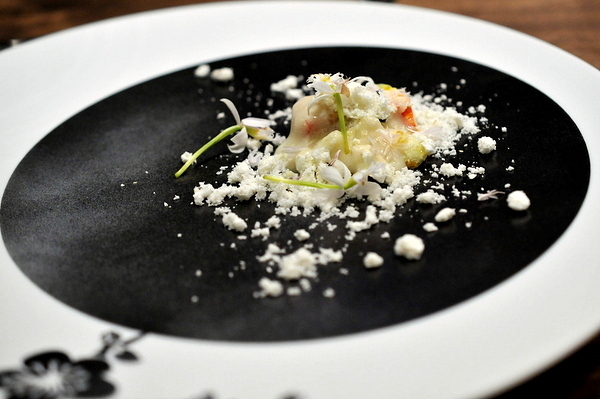 Chef Beran cut his teeth at both Tru and Alinea. 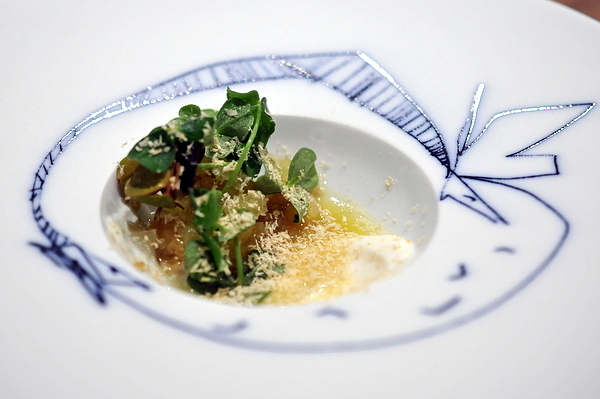 In 2011 he was tapped as the executive chef of Grant Achatz's new restaurant Next. He lead the ambitious new restaurant through 15 different menus, earning a slew of James Beard nominations and a couple awards. In April 2016, Chef Beran served his final meal at Next before striking out on his own. 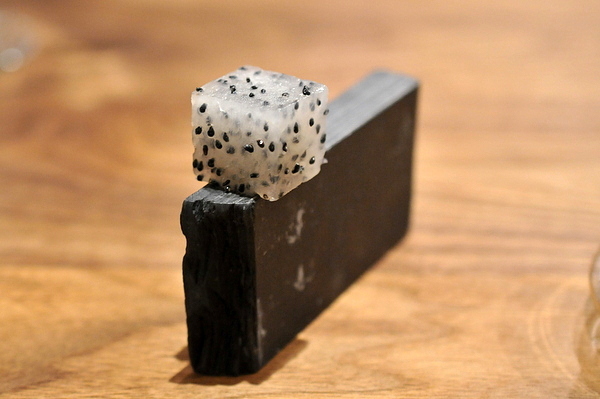 Following the trend pioneered by Achatz and Kokonas at Next, Dialogue requires guests to purchase tickets in advance of the meal. With only 18-seats spread across a handful of tables and a bar overlooking the kitchen, it makes sense that the restaurant lacks the ability take on the burden of no shows. 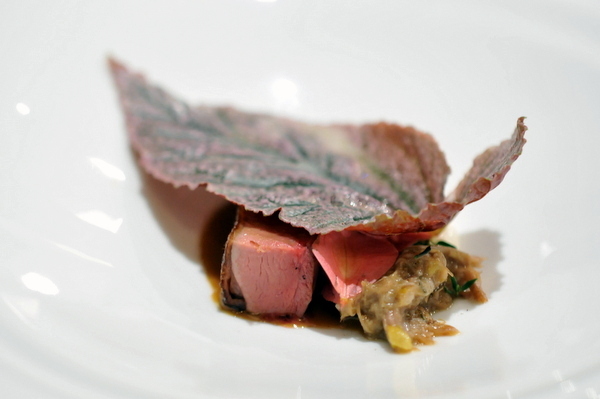 Beran adopts the Kaiseki philosophy of tasting the seasons and his menu starts with a springtime levity , before transitioning to a hearty summer warmth, and finishing with the flavors of fall. Caviar is a great start to any meal whether served with traditional accoutrements or as a composed dish as we have here. 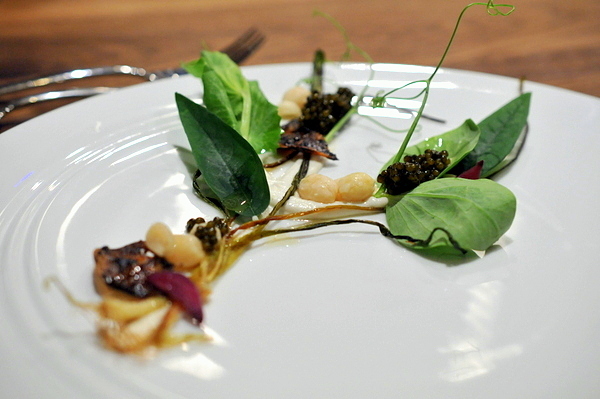 The Osctra Caviar is paired with fresh basil, charred scallions, and peanuts two ways. The basil jumps out immediately laced with a twang of lime. The smoky-bittersweet scallions follow while the peanuts bring a lovely textural component soft boiled nuts and a dense creamy butter. 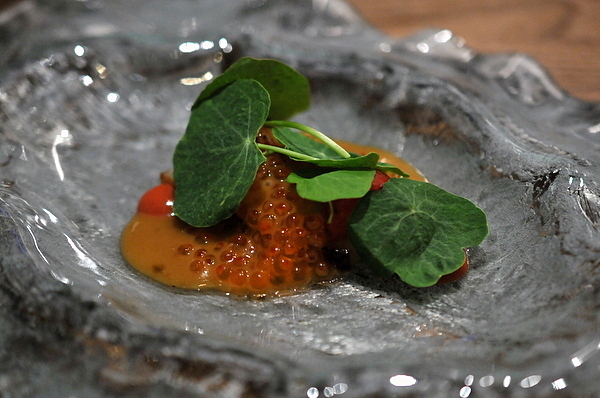 The caviar overlays a nutty salinity over the entire dish. 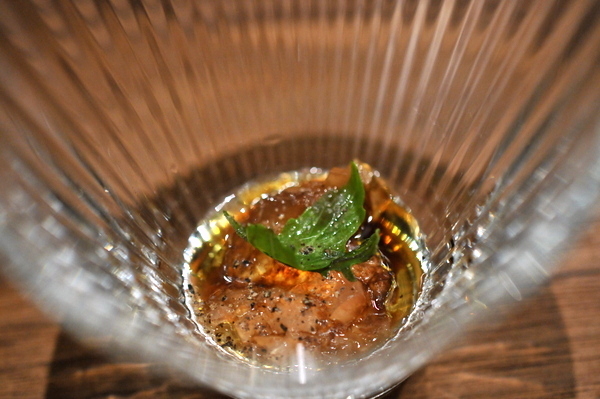 Chef Beran has a penchant for aging his own vinegar which made several appearances throughout the meal. First up was a shot of roasted banana vinegar (I didn't even know that was a thing) topped with a brown butter and peanut foam. The vinegar has a light tang tempered by the aroma of the ripened cooked fruit. 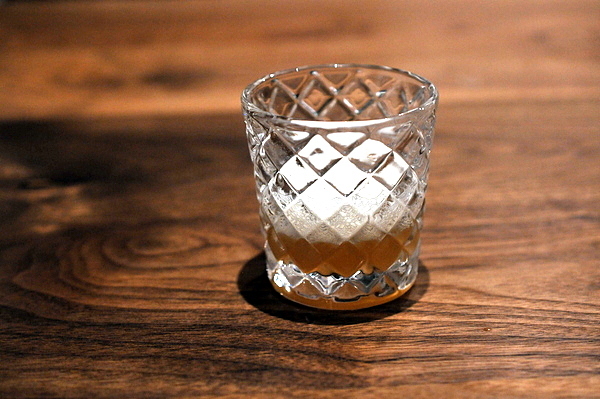 The vinegar really shines when the foam comes into play bringing with it a savory-sweet toffee essence turning the tipple into a liquid Bananas Foster. 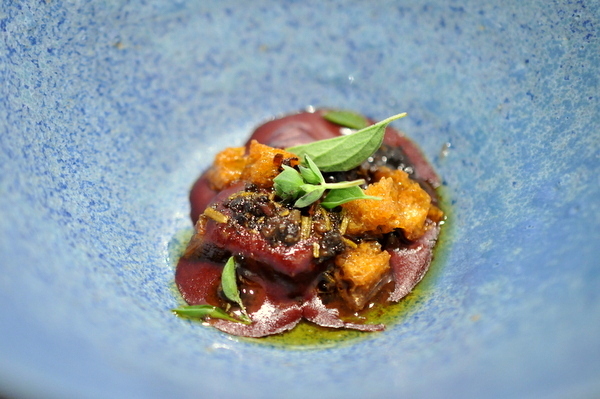 The third course was markedly heavier than the first two with a creamy base of blackberry thickened with bone marrow. A bit of short rib centers the dish with a meaty holiday-roast like heft. A bit of cooked fruit add a pop of tart sweetness and the croutons provide an element of structure. The next two courses were intentionally designed to be completed by the wine pairing, a white blend that brings a bright juicy acidity. While I appreciated the soft notes of jammy peach and flowers, the fennel definitely stands out with a pungent licorice flavor. The acid from the wine does help matters but the bit still felt unbalanced. With my palate still reeling from the fennel, the dragon fruit had almost no flavor. Chewing on the soft mild block of fruit I kept waiting for something to happen, but alas, whatever was supposed to happen was lost on me. For Chef Beran, roses always marked the end of spring and popcorn was evocative of summer evenings. 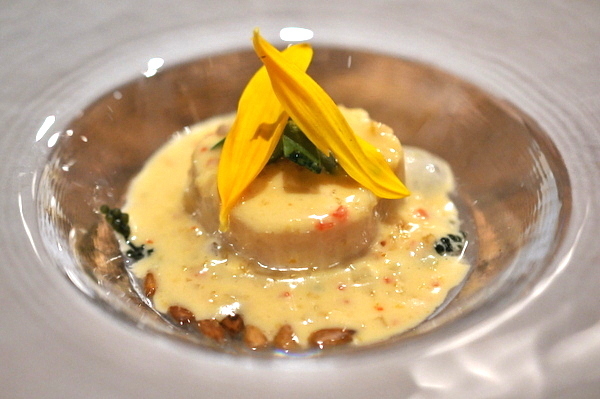 The crab meat is covered in a subtly fragrant floral perfume. The crumbled popcorn comes through loud and clear; a beautiful compliment to the sweet crab meat. "burnt lettuce that thinks it's a peanut"
Som Tum or green papaya salad has always been one of my favorite Thai dishes. 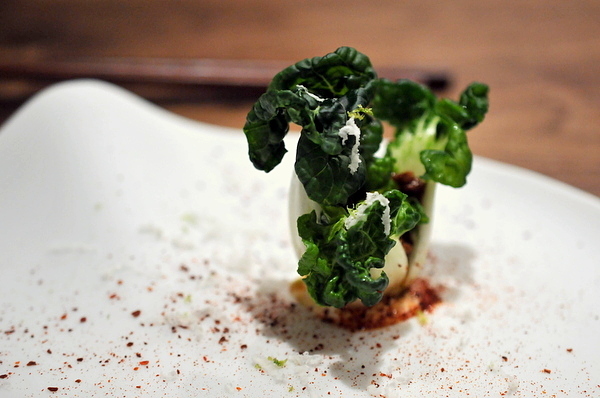 This elegantly minimalist Som Tum has the traditional elements of papaya, chili, lime and sugar with one key difference; the peanut has been replaced with charred lettuce. Despite this change, the flavor profile is eerily faithful to the classic recipe. The squab was served two ways, a sublimely supple breast and lusty hash. The breast is perfectly cooked with a bit of extra flavor from the skin and a creeping hint of parsley. The hash has much more meaty richness up front but finishes with a lactic creamy tang and faint whisper of heat. 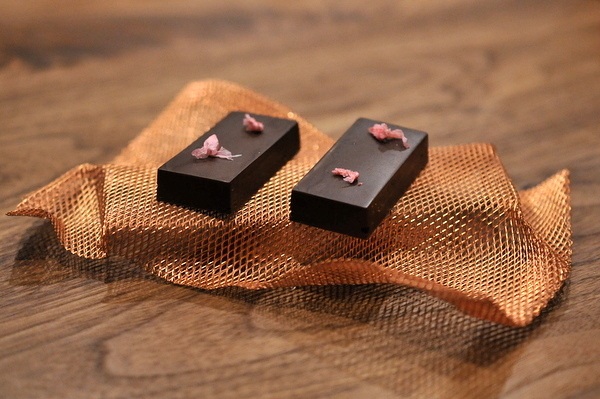 The chocolate has a dark bitterness and bright red fruit center that paired nicely with the lingering flavors of squab. 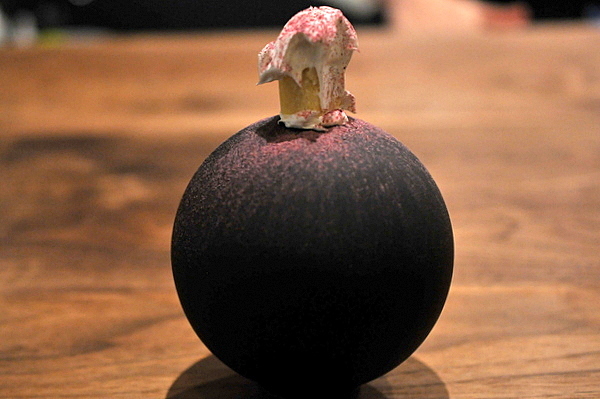 This dish is something of a psychological experiment, with 76% dark chocolate the filling flavored solely with cherry juice, there isn't much sugar in this course, but we're so conditioned to think of chocolate as a dessert or candy that most diners are taken aback when its served in the middle of the meal. Along with the chocolate came a couple pieces of dehydrated rhubarb. 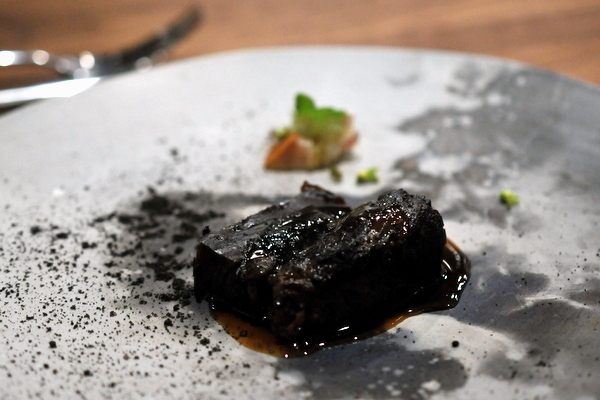 The texture was more akin to fruit leather, the dense chewy "chip" has a tendency to get stuck in the teeth, which as it turned out was by design, with the remnants of this course needed to flavor the next. Choy Sum, a mainstay of many Cantonese restaurants, was a regular part of my diet growing up, but I don't think I've ever had it served raw. The vegetable is laced with a strawberry chili sauce that was simultaneously sweet, funky, and spicy; a bold accompaniment to the fresh succulence of the green. 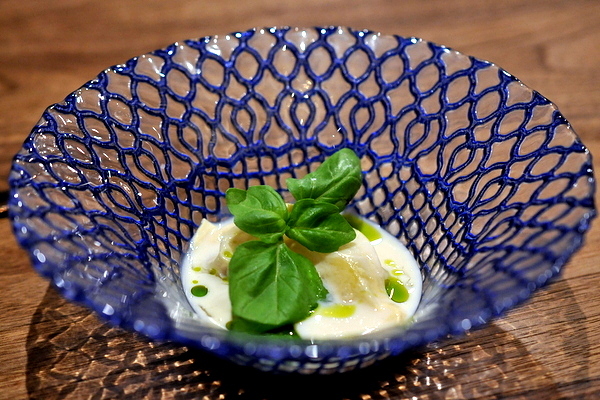 Chef Beran generously described this course as a "salad" but it was the stuff beneath the leafy nasturtium that stole the show. The tender slab of decadent pork belly gets a tangy lift from the jammy strawberry as well as the funky heft of the sambal. This was another of the psychological experiments. Diners either feel the dish is Japanese or French depending on the flavors the staff chooses to highlight. Indeed, with my focus diverted to the heady beurre blanc, the distinctive flavor of the yuzu kocho registered only as a vague sourness. With this course the Dialogue crew deftly recreate the feeling of a backyard barbecue, the quintessential capstone to summer and an appropriate way to welcome the onset of fall. The plate of monochromatic ingredients doesn't look particularly appetizing but the mix of smoke, onion, and soy was so eerily familiar to the family cookouts I had as a child that I couldn't help but feel an instant affinity for this course. Ironically the savory portion of the meal wound down with re-imagined versions of classic soup and salad recipes. 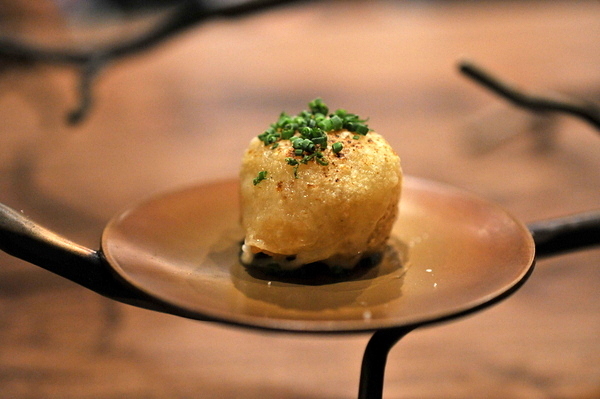 Inside the cheese covered puff was a concoction of rich sweet onions. 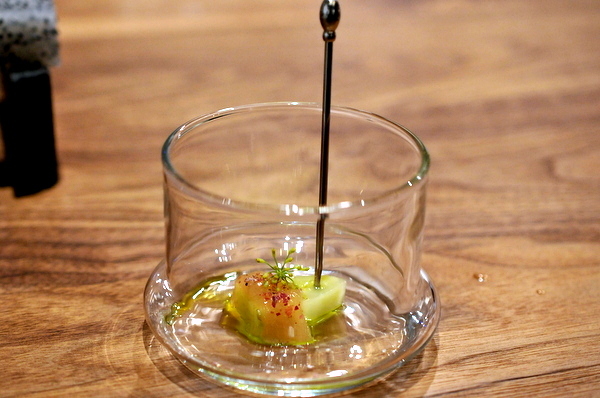 "memories of a tomato salad"
The shot of salad was centered around a tomato gelee. The bright summery morsel has a beautiful tomato fragrance contrasted by a peppery nuttiness. Our first dessert was a tangy lemon shortbread topped with a sweet persimmon frosting. The sweet and sour flavors complimented each other quite well. 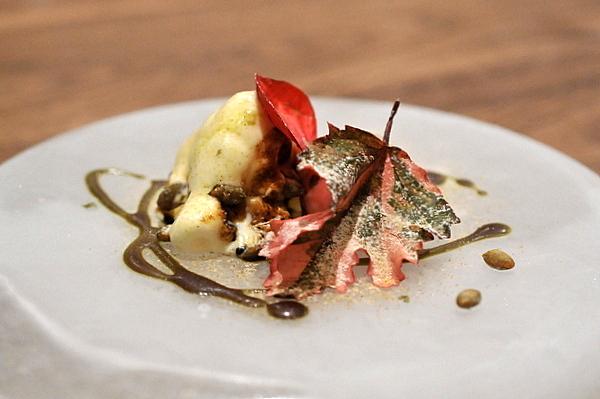 The red and white color of this dish along with the prominently placed leaf, gave our last dessert an unintentional Canadian feel. The flavors were indeed autumnal with a pumpkin spiced ice cream and toasty pepitas. The leaf had an oddly tangy flavor to it that helped cut the heft of the pumpkin. 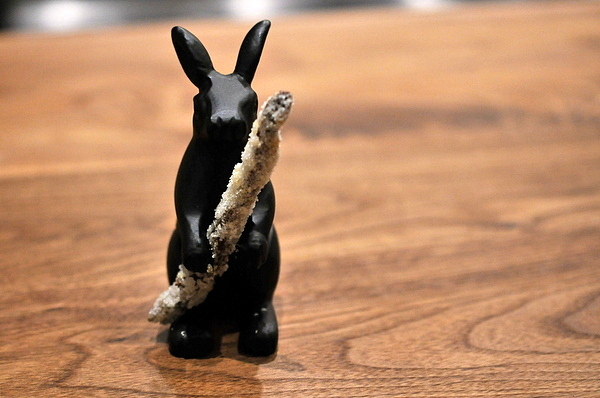 "a carrot pulled from the snow"
The petit four consisted of a cooked carrot tossed in a sugar frost. My girlfriend B aptly dubbed this a paleo churro. Given Beran's resume, I had super high expectations for Dialogue and I'm happy to say that the meal easily met them. Despite his stellar resume, Beran comes across as very approachable; confident yet self-effacing. Beran and his crew engage with diners as much as they want to be engaged. A couple engrossed in conversation will receive a different level of explanation with each course than say a couple of food bloggers and their friends who are intently following the action in the kitchen and hanging off chef's every word. At one point, Beran explained his goal was for guests to focus on each other with the meal as one element of their experience, a catalyst to generate dialogue. 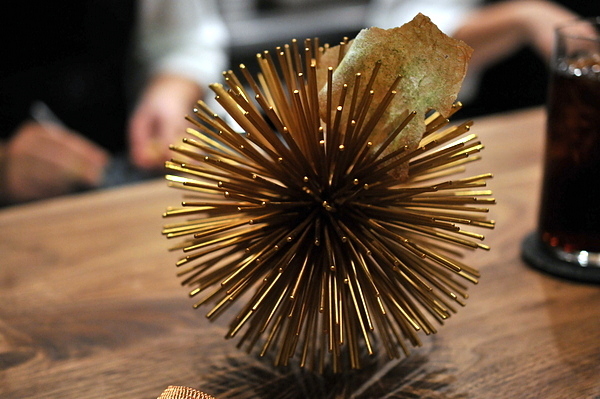 To that end the meal leverages elements of narrative, psychology, and of course the avant-garde techniques Beran honed over the past decade in some of America's finest kitchens.